Add a simple sentence to each sentence below, then join the two simple sentences with a coordinating conjunction to create a compound sentence with proper punctuation. The first one has been done as an example. 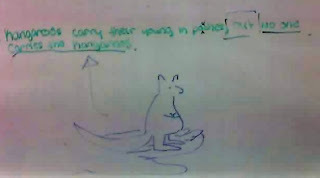 "Kangaroos carry their young in pouches, but no one carries the kangaroos."